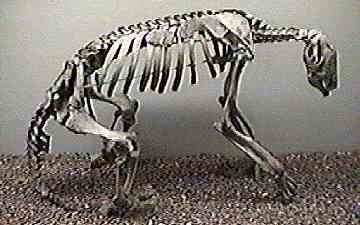 Bones of a giant ground sloth from the ice age. 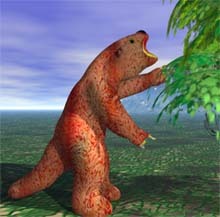 The giant ground sloth was one of the enormous creatures that thrived during the ice ages. Looking a little bit like an oversized hamster it probably fed on leaves found on the lower branches of trees or bushes. The largest of these ground sloths was Megatherium which grew to the size of a modern elephant with a weight over five tons. Giant Sloths had very large, dangerous-looking claws. Despite their size they were probably only used to strip leaves or bark from plants. Their teeth were small and blunt in keeping with their herbivore diet. Examinations of their hip bones suggests that they could stand on their hind legs to extend their grazing as high as twenty feet. Were Some Giant Sloths Really Carnivorous? Most scientists think that the large claws on Megatherium americanum were used for stripping leaves and bark for its vegetarian diet. Richard Farina, a paleontologist at the University of the Republic in Montevideo, Uruguay, disagrees. He measured the length of the olecranon process (the bony part of the elbow where the triceps muscle attaches to the forearm) on m. americanum and it was surprisingly short. The shorter the length, the faster the arm can move. Faster movement like this is usually the sign of a carnivore. Farina thinks this 12 foot high version of the sloth might have gone carnivore and hunted glyptodonts (giant armadillos) that lived at that time. If so the sloth probably rolled them over and stabbed them in the soft underbelly using its long claws. Like other giant creatures that disappeared at the end of the Pleistocene period (about 10,000 years ago), Megatherium, its smaller sloth cousin, Mylodon, and other varieties of the giant sloth are now extinct. Only the small tree sloth survives today. Or so scientists believe. In the 1890's an Argentinean explorer, geographer and adventurer, Ramon Lista, was hunting in a portion of his country known as Patagonia when a large, unknown creature covered with long hair, trotted past the party. To Lista the creature looked like a gigantic armadillo. The party shot at the beast, but the bullets seemed to have no effect. Professor Florentino Ameghino, a paleontologist in Argentina, heard the Lista story and began to wonder if the strange beast was a giant sloth that had survived from the Pleistocene. He might not have put much stock in the Lista story if it had not been for legends he'd collected from Indians in the Patagonia region about hunting such a large creature in ancient times. The animal in the Indian stories was nocturnal, and slept during the day in burrows it dug with it's claws. The Indians found it difficult to get their arrows to penetrate the animal's skin. A large sloth standing on his hind legs could tower twenty feet in the air. Ameghino also had a piece of physical evidence. A small section of apparently fresh hide found by a rancher named Eberhardt on his property in a cave in 1895. The hide was studded with small, hard, calcium nodules and would have been impervious to the teeth of Pleistocene predators. It seemed likely that it would have also resisted Indian arrows and Lista's bullets. So sure was Ameghino this was the creature Lista had seen he named the creature after Lista: Nemoylodon listai, or "Lista's new Mylodon." Expeditions to Eberhardt's and other caves, recovered additional pieces of hide along with evidence the Eberhardt's cave had been home to both men and Mylodon. With the development of the Carbon-14 dating method in the twentieth century the age of Mylodon remains in the Eberhardt's cave was settled. Dung found in the cave was more than 10,000 years old. The skin was estimated to be 5,000 years old. Conditions in the caves may have preserved it making it look fresh to the eye and fooling Ameghino. 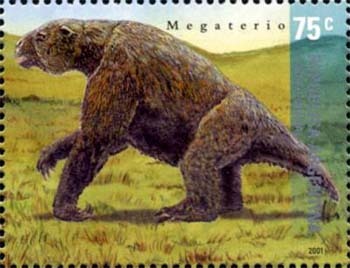 This giant sloth appears on a stamp issued by Brazil. No additional evidence has turned up that the giant sloth survives today. What killed them? Like other giant species of the Pleistocene period, climate change related to the end of ice ages, may have been the culprit. A competing theory, however, is that as man spread into regions occupied by the giant sloth, he may have hunted them, along with the mammoth and mastodons, to extinction. Copyright 1996-20006 Lee Krystek. All Rights Reserved.